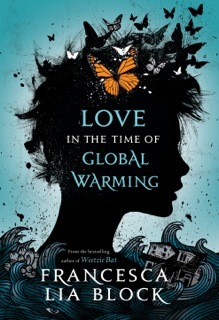 Recently an interviewer asked me about the proliferation of LGBT characters in my books, especially Love In The Time of Global Warming (a contemporary Odyssey in which seventeen-year-old Pen and her ragtag band of friends search for her family in a post apocalyptic, neo-Homerian Los Angeles) and if I consciously chose "hot button topics" when I wrote for a teen audience. I told the interviewer that I did not set out to shock anyone or preach any particular message but that my work reﬂects my life and core beliefs. For example, people are equal and should be treated that way. The same interviewer wanted to know how I could write about LGBT characters and teen characters in general since I am neither of those things myself. I never really thought of it that way. Being a writer requires empathy. I would argue, so does being a person, that it might be essential to our collective survival. I can remember what it was like to be a teen, and I can easily imagine the challenges of being an elderly adult and also how it would feel to love someone of the same gender, in what seems like the most natural way, with my body and my heart, even as others questioned this choice. "Do you ever feel that you aren't taken seriously as a writer of literary ﬁction for adults (The Elementals, Quakeland, Necklace of Kisses, Ruby and the upcoming Beyond The Pale Motel) because of your success in YA?" the interviewer asked. I would hope that all of my ﬁction is at least somewhat "literary" and that just because something is published for a younger audience doesn't mean it won't be given the same respect that any well-written book might receive. That it will be relevant to an older audience as well. I never set out to label my characters as "gay characters" or my books as being speciﬁcally for the LGBT or young adult market. I write stories about real people based on those in my life and in my heart. I am fortunate to have an editor like Christy Ottaviano at Holt Macmillan who publishes them. In 1989 when my original young adult editors, Charlotte Zolotow and Joanna Cotler, at Harper Collins, took a risk and published Weetzie Bat for a teen audience, the fact that the eponymous main character sleeps with her best friend, punk rock Dirk, and his boyfriend, surfer Duck, to have a baby was very controversial. Now gay characters and threesomes are much more common in young adult literature. In fact, just about everything is more common in YA. self acceptance" by Publishers Weekly. I even found a video rant of a man with a thin, bellylength white beard damning the book and its author, and admit I felt a bit fearful for a time after that. (And this is for writing about a gay character; how would I feel if I was being attacked because of loving someone of the "wrong" gender?). The heroic librarians and press came to my rescue and the whole thing blew over, but it made me aware that from the safety of my liberal L.A. bubble I don't really realize how threatening the topic of queer culture (and God forbid, gay marriage!) is for much of the country. Even today, four years after the book burning threat, at a time when my 11 and 13-year-old children sing and rap along with the Macklemore song "Same Love" ("I can't change, even if I tried, even if I wanted to") and watch Glee with me. I'm not trying to shock or taunt anyone by writing LGBT characters who face the perils of homophobia, violence and global warming. I'm just writing about my life and the people I love. And hope that others might recognize a small piece of themselves in these characters, and fall in love with them, too. For more on Francesca Lia Block, visit her official webpage. Love in the Time of Global Warming can be found here.